at MBO. Note the sharp hooked beak, and the notches on the upper mandible. Notes: Banding this week took place on Tuesday, as the final flurries from the latest day-long snowfall were tapering off. Things started off slowly with just a trickle of Black-capped Chickadees. Midway through the session, we caught an interesting Hairy Woodpecker, with a few orange feathers in the rear of the crown. Most likely it was an old female with a diet that caused the feathers to appear orange rather than red. We thought that would be the highlight of the day, but on our final net round it was surpassed by a second-year Northern Shrike, presumably the one which has been seen (and heard) in the area regularly this winter. 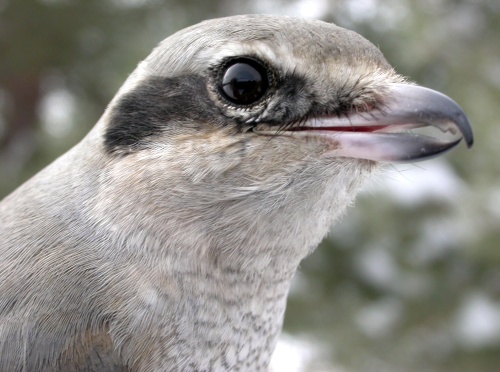 As is normal for shrikes, this one knew all too well how to use its beak, and the two of us who handled it each lost some flesh and blood in the process! We ended up with a relatively small number of birds banded today, but a nice variety, also including a House Finch, House Sparrow, and American Tree Sparrow; our lone return was a Slate-coloured Junco banded here in October.